Mary Apffel’s love of nature and light is captured in her artwork that portrays nature through enchanted realism using paint and collage on canvas and woodblock. She loves the Methow Valley and finds endless inspiration from its natural settings and innovative community. Mary settled here in 1979, homesteading on 20 acres in the Upper Rendezvous area with friends and family. Although she was only able to stay a couple of years, Mary and her family remained connected to the valley, visiting their cabin often until moving here permanently in the summer of 2015. 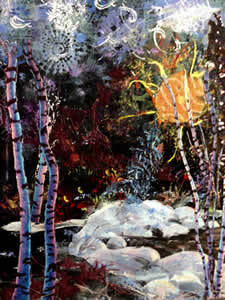 Mary’s love for and connection with light, trees, rocks and other elements of landscapes appear in her most recent artwork. Lances of sunshine that pierce the canopy of a wood.